Jim Beam whiskey celebrated its 200th birthday in 1995. The first barrel of bourbon was produced in 1795 by Jacob Beam the great-grandfather of Jim Beam. Today Jim Beam is one of the most popular bourbon whiskeys in the world. A collecting interest has grown around the whiskey for memorabilia and especially for Jim Beam bottles and Jim Beam decanters. Pictured: A collection of Bottles including Williamsburg, Nevada Centennial, Ponderosa Ranch and Del Webb’s 400 Mint Las Vegas. An International Jim Beam Bottle & Speciality Club (IJBBSC) boasts over 150 affiliated clubs with over 5,000 members. Early bottles and decanters are extremely as collectible as are the number of limited editions that are produced. The IJBBSC has been holding conventions since 1970 and each year a limited edition bottle is produced. Up until 1992 Regal China from Illinois made the edition, but since that time Wade has been producing them. Many Wade collectors have been attracted to collecting the bottles and in the US conventions often feature both Jim Beam and Wade. The different series and range of bottles and decanters available is considerable and include: the armed forces series; beam award series; convention series; club series; famous people series; and many others. Subject matter ranges from Rennie the Fox to Corvettes, from Paul Bunnyan to Emmet Kelly, from Trains to bottles dedicated to States and Sporting Events. 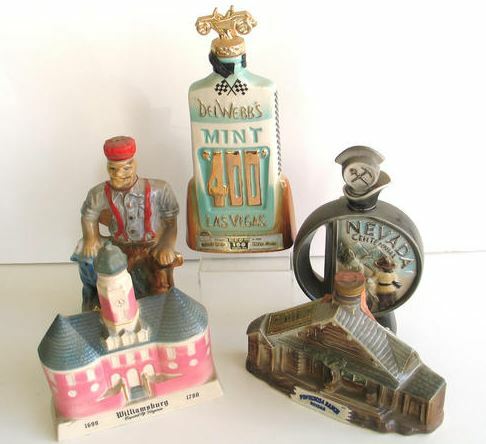 Shapes vary from replicas of objects and buildings to figurines and animals, as well as traditional glass bottle shapes. 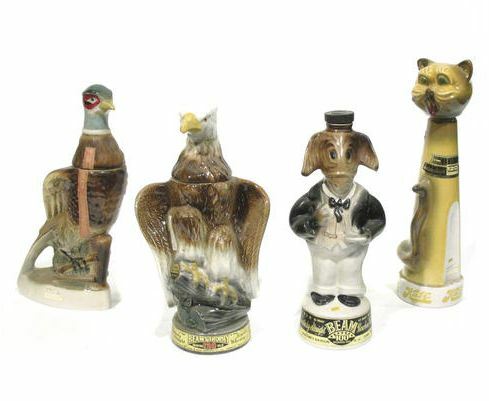 Pictured: A group of figural decanters. Sold for $94 at Bonhams, Los Angeles, Dec 2005. The diverse nature leads to the decanters and bottles being an extremely interesting collectible. The Jim Beam history and well established network of clubs and gatherings only adds to increase the collecting experience.